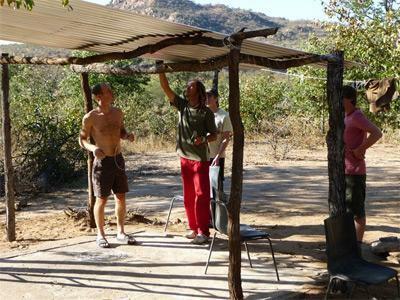 Here you will find detailed information about the different areas in which you can get involved on this Conservation & Environment project at Wild at Tuli Safaris in the Central Tuli Block, Botswana. We are creating a comprehensive list of the birds of the Central Tuli Block using fixed point observations and research drives. With a strong data base we can then investigate their behavior (e.g. migration routes and seasons), density and ranges. Regular census drives also enable us to collect information on the larger mammal species found. Predator-prey relationships are the basis of the savannah ecosystem and we need to know how the reserve is evolving with respect to these vital interactions. We record GPS locations of our sightings, photograph individual animals and continually monitor the different areas that we visit. We are then able to construct a realistic model for animal movements and migrations of new groups and new species into the Central Tuli Block. There is a lot of old fencing left lying around the Central Tuli Block farms which has been lowered in recent years but not removed. This can cause injury to any animal that comes across it. 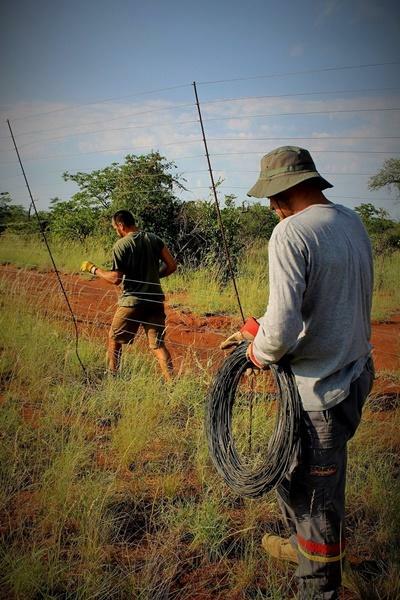 Poachers also make use of old fencing wire to build snares and traps. Any fencing left standing can enclose elephants and other large grazers which in turn increases pressure on the area. We have compiled comprehensive maps of the areas that we visit. This enables more specific data to be collected on animal populations and their ranges. A complete map of the road system will also allow more complete surveys. This enables us to travel around and cover more areas. We can then survey the different types of vegetation, animal populations and collect more accurate data. The construction of new roads also enables better visibility of wildlife. The harsh changes between the seasons in Southern Africa mean that for up to 9 months of the year animals are struggling to find sufficient water. Dropping water levels in the rivers and high concentrations of predators around these areas means that the majority of the prey species cannot find enough water to survive. The drilling of water holes at different locations enables these species to endure the dry season. It also helps us with collecting data as the wildlife will tend to concentrate around these artificial reservoirs. Careful management of these water holes also allows us to manage the reserve more effectively. By changing the locations and availability of water we can move wildlife from heavily affected zones and allow the vegetation to recover. Top soil holds the majority of the nutrients to be found in the earth and heavy rains cause these to be leeched away. By creating run-off channels, planting stakes in open areas and carefully placing large rocks we can reduce the loss of top soil in the torrential rainy season. This gives the flora of the reserve a high chance of survival. Historical activity and local industry has led to the invasion of foreign plant species which are out-competing the local flora. This change in species composition is unnaturally fast and ecosystems cannot adjust quickly enough to incorporate these new additions. This creates unbalance for both the animal and plant life and so it is essential we remove as many of these invaders as possible. 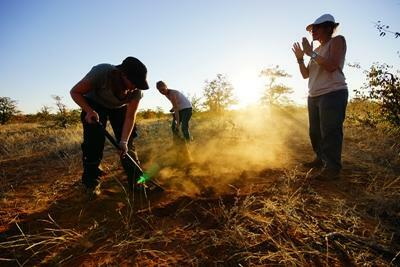 Volunteers participate in regular workshops designed to teach you about different aspects of the project and the environment you will come to call home. Topics include conservation debates and bird identification.